It might have been in the air after Raubbau’s extensive box set and the subsequent live performances, it sure has been hoped for by more than a few, and here it is confirmed, the first Morthound album in over 20 years: the title somehow gives it away, this is an absorbing exploration of the dark ambient realms, a sometimes outright frightening dip into the pit, yet composed with the expert knowledge of a now seasoned producer. 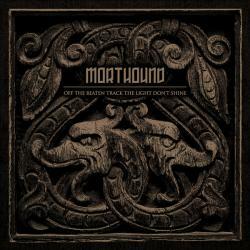 way off the beaten track, morthound returns triumphantly to the fold. So the question is naturally, which of his own traditions as morthound would Bj Nilsen explore on this comeback – the industrial/noise-heavy, the brute, the cold ambient, the psychedelic, the ritual, or even the academic/experimental attitude of his post-Morthound career? the answer is: all of the above, but enveloped in a totally coherent, updated approach, subtly taking up the threads and weaving them into a good 45 minutes of flawless dark atmosphere. the path off the beaten track starts in a tense, minimal and unexpectedly bass-heavy fashion with ‘The Device’, before the epic ‘Between Midnight And Dawn’ brings in the somber layers of synthetic darkness that are classic Morthound; in ‘The Munich Manual’ we are confronted with weird off-key elements, and ‘Disquieted’ turns out a malicious death industrial tune seething with distortion; ‘Disembodied Voices’ portrays emptiness as sound and ‘The Black Forest’ finishes the album with almost harmonious, calming beauty. the challenge of a comeback album after that many years is obviously to handle the balancing act between picking up and respecting your own legacy on the one hand side, and creating something meaningful for the present on the other. With ‘Off The Beaten Track The Light Don’t Shine’ Bj Nilsen has succeeded in both, created an album that will find avid followers in different generations of listeners, and has all the potential to become a genre classic.